Rodent Rock Bait Station is THE ultimate outdoor rat bait station ! 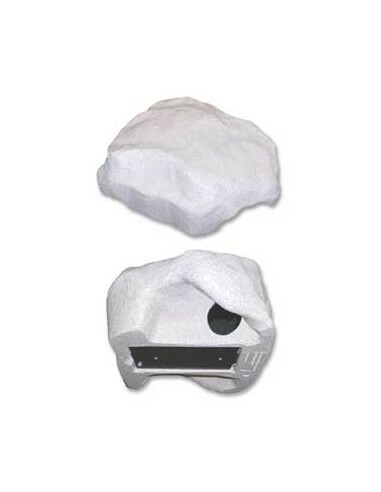 Rat Rock Rodent Station looks like a rock and blends in with your ground cover to eliminate rats and mice. The surface is textured to look and feel like a natural rock. Comes in granite, sandstone or slate gray colors. Inside is a hidden chamber that keeps rat bait such as Contrac or Final protected from moisture, pets and children. Great for use around homes, office buildings, restaurants, hospitals, and other structures where outdoor control of rats and mice is necessary. Hatch on bottom of RatRock opens to expose the hidden feeding area for easy placement of rodent bait. Great for use around homes, office buildings, restaurants, hospitals, and other structures where outdoor control of rats and mice is necessary. It has a clam shell type opening that opens from the top by simply using a slotted screw driver into a key hole on the front of the rock with a turn it unlocks and opens very quickly. Its inside compartment has a waterproof baiting system that allows you to use block bait, pellet bait and liquid bait. Its patented quick release snap lock makes quick work of securing professional block baits that will hold under any severe activity that may occur. The station comes with a salt pad that deters slugs and snails from entering your bait compartment and consuming the bait. The pad also is attractive to rodents as a salt lick. There is a predrilled hole in the bottom to allow any kind of anchoring stake to be used. The station has a reinforced hidden hinge component that gives the station a more natural look without being seen as a hinge. Discreetly place bait stations in plain sight disguised as landscape rocks. Comes in Slate Gray, Granite (shown above) and Sandstone colors. Compare At $49.95 !!! Our everyday low price is only $43.95 or LOWER !